re-print in the Toronto Star - March 1960. W. J. Crowe has just started up the shop in the front part of Mr. john Hogg’s building, and is prepared to supply his customers with meat of all kinds. James McDermott has been 17 years in business in Paisley. First he started a bakery and confectionery business adding afterwards groceries, boots and shoes in the store now occupied by Mr. Alex Colborne, until he sold out to Mr Robert Wilson in 1888. Now he is to be found in the brick grocery north of the Royal Hotel, where he has a splendid bake oven and keeps a large stock of fresh groceries. Mr. D. Fisher bought out the Hanna property in 1869, and conducted the Flour Mills and saw-mill. He afterwards added a carding mill; built a new dam and put up a new saw mill. In 1885 his brother, Arch Fisher went in with him, when a new roller flour mill was erected and the splendid new woollen mill, which adds much to the appearance of the town as well as contributing largely to its wealth and prosperity. He employs eleven hands in the manufacturing of tweeds, blankets, and fine and course woollen goods of all kinds turning out 100 yards daily, and ships to all parts. Robt. 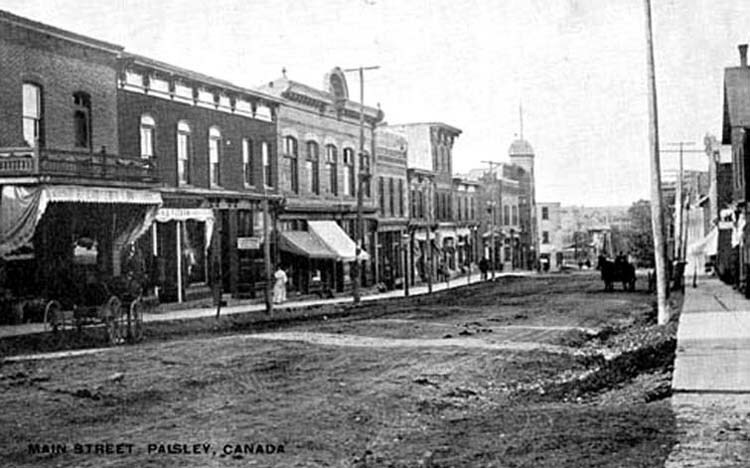 Scott came to Paisley in 1873 and bought wheat for several years on commission for some of the leading firms of Ontario. Of late years he has been buying for himself, and handles in a season from 75,000 to 100,000 bushels of grain of different kinds, shipping principally to the Liverpool and Glasgow markets. A few years ago also in company with Mr. ].C. Gibson, he added a flour and feed and provision trade to it, occupying the old building which was the first store erected in Paisley, thirty-six years ago. Soon after it Mr. Scott took the business to himself and is doing a good trade in the various brands of flour. “Business Centre” was established in 1878. He afterwards bought out the business of Mr. Donald Sinclair in the brick store on the market and did a large trade in dry goods, boots and shoes. In _Iuly 1889 he moved down to the brick store south of the Hanna House. Here his business was very much increased, but he had the misfortune to be burnt out in the late disastrous fire. The stand which he now occupies is only temporary, as he has bought the store of Mr. Donald Sinclair in the Market and purposes going in on the first of March. Extensive alterations will be made including a new front. All lines of merchandise in good quality and at fair prices. This business was established by Mr. ]ohn Hogg in 1870, who fitted it up with machinery and manufactured for the retail trade, employing at times considerable labour. Two years ago Mr. Ellis who has worked for over ten years in the establishment, took an interest and their manufacturing is now almost all for the wholesale trade. Their output is shipped to different parts of Ontario, and consists of centre tables, sideboards and extension tables. The undertaking department receives special attention and in this they are fully abreast with the most advanced methods employed in the country. The art of embalming they fully understand and practice in a manner equal to what can be done in any of the cities. 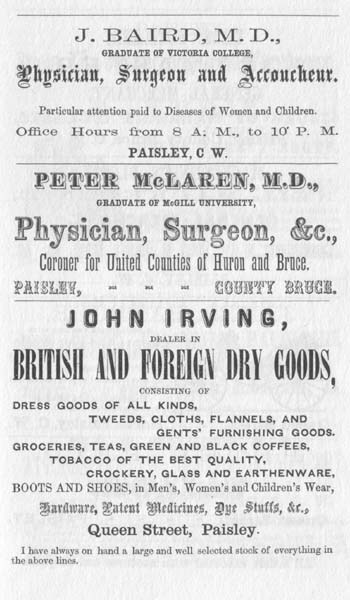 Mr. McFarlane came to Paisley in 1873 and opened out a general store in company with his brother-in-law, Mr. Little. Soon he got the business to himself and did a large trade until he retired from business for a couple of years. In 1882 he again started in Mr. Fenton’s building, where he was in business until the fire, after which he moved which stock he saved into Mr. Sinclair’s building. It is Mr. McFarlane’s intention to go out of business and consequently his stock is lower now than he has ever had it. McArthur’s Carriage Works are conducted by Mr. J.B. McArthur in his shops at the east end of the Saugeen Bridge. Mr. McArthur established this business in the year of Confederation 1867. His plows some twenty years ago were famed in the Whole country, and no prize plowman would risk a match without one of the plows. Of late years he has turned his attention more to the manufacturing of carriages. His output for the year will go about 50 buggies and rigs of different kinds, and these he finished in the best of style. Mr. Davey conducted a business that was established in 1877. He has run it two years, buying out Mr. J.G. Gordon, and does a good trade in men’s and boys’ suits. He suffered by fire with the rest and now occupies part of Mr. Mannel’s building. Mr. Mannel has but lately taken charge of this business on his own account. It was established by Geo. Chambers 21 years ago, who sold out in 1887 to Mannel and Greig. Partnership was dissolved in December and now Mannel is prepared to do all work in his line. Thos. 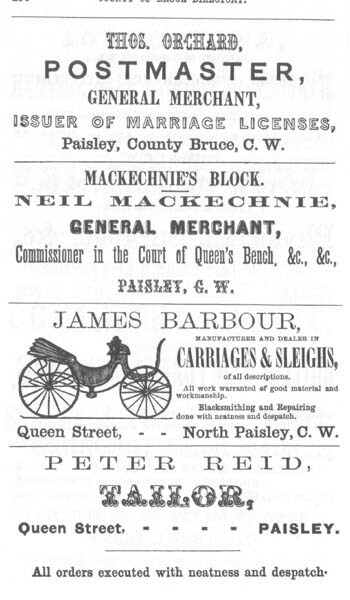 Pinch began the hardware and tinsmithing business in Paisley in 1872, as partner in the firm of McDonald and Pinch. After dissolving the partnership he assumed full control. A large stock of shelf and heavy hardware is carried and he does a big trade in stoves and tinware. 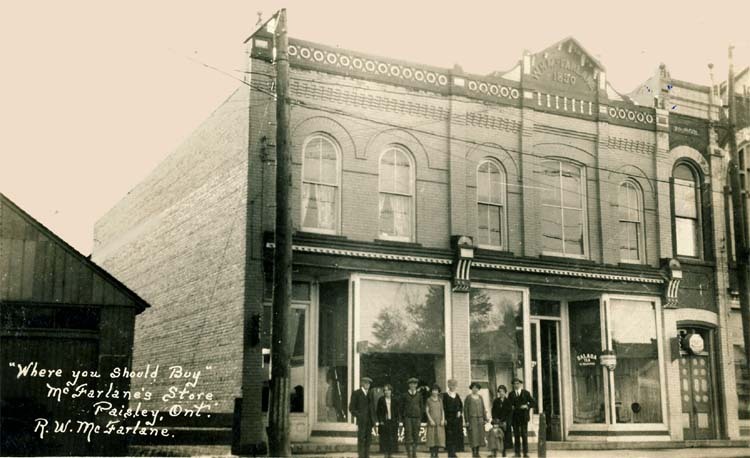 Began business in Paisley first as a cutter in one of the stores and after a few years he went to Port Elgin where he went into business on his own account, but finding Paisley more to his liking, he came back and opened out a shop in his present stand. He put in a stock of tweed and trimmings and ran a merchant tailoring establishment which he has ever since continued. This business has been in operation about half a year. 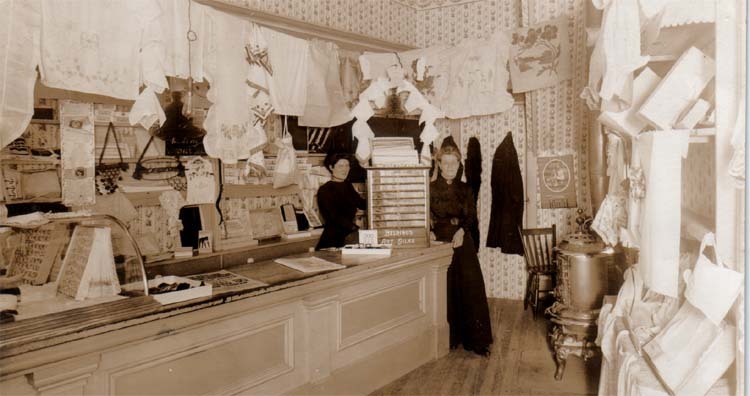 Mr. Colborne opened out a choice new stock ofdry goods in the old bakery stand occupied by W. Agnew. He has a large stock of the latest patterns in prints for the spring trade, and is selling fur caps, mitts and kid gloves at a sacrifice. Mr. Andrew Wilson opened this business in 1886 and put in a good stock of Flour, Feed and Groceries. Mr. Wilson is also agent for the C.P.R. and sells tickets to any point on their lines. Travellers going west will secure every advantage by getting their tickets from him. F.E. Sheppard commenced business in Paisley in 1880 and has conducted it steadily ever since. He is a skilful hand at the business, and does a large amount of repairing and his stock of jewellery is full and well selected. F.E. Sheppard, Jeweller is also agent for Bell telephone and manages the central office. 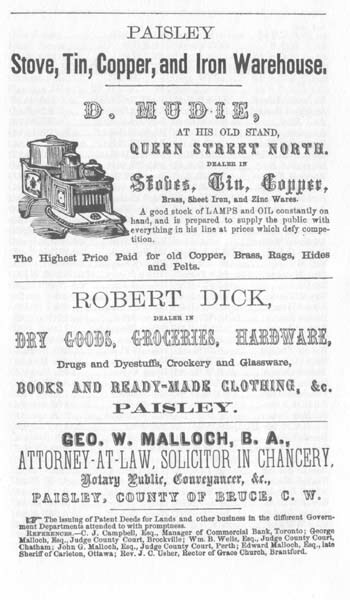 A. Colborne of the Farmer’s Cash Market is one of Paisley’s pioneers, and was one of the first saddlers in the place. In 1884 he turned his attention to the market business and gradually increased it until he has become a noted exporter of eggs and poultry. He manages the business in Buffalo and there disposes of the commodities sent to him from Paisley. This cash market has been a boon to the farmers. 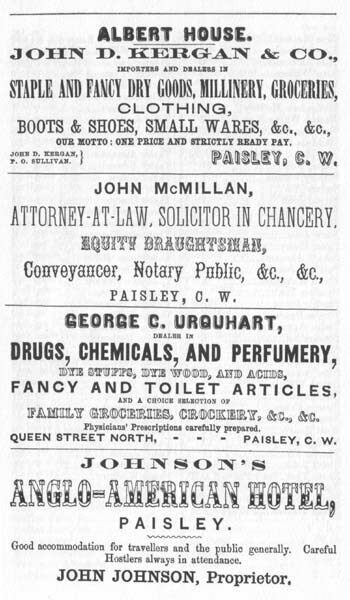 H. Coleman commenced business in Paisley in 1874 in butchering and a local trade in salt meats and received a large share of the public patronage. He has by far the largest stock of meats this year that he has ever had. He dresses all his own hogs in a well fitted slaughterhouse at the rear of his curing house. In 1887 J.M. Hargreaves became manager of the Paisley branch. They always have and are doing a very extensive dispensing trade in which they make a specialty and their reputation for such is widely known, their stock is of very finest quality comprising a full assortment of drugs, chemicals, dye stuffs, trusses of all kinds, perfumery, toilet soaps, sponges, and Druggists sundries with the leading patent medicines. Hargreaves Bros. have the G.N.W. Telegraph Company and Allan Line Steamship companies agencies and in their store is a telephone connection. 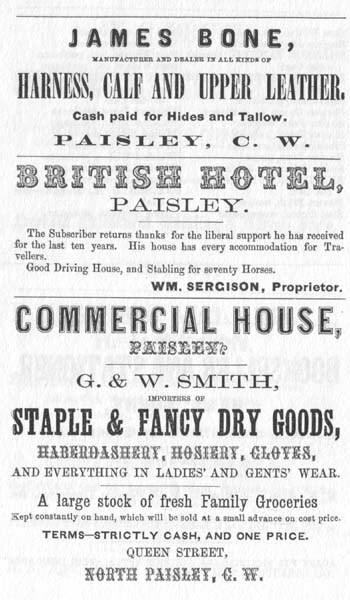 Of the “Leading House”, has been in business in Paisley since 1879. He carries a stock of dry goods and general merchandise to the value of from $12,000 to $15,000 the heaviest stock in town and does a very large trade. After the fire in October last, which left him the heaviest loser of the lot, he immediately set to work, and in a short time he had a large, new and well assorted stock opened out. His motto is to carry the best goods at the lowest prices. McDonald and Son, Hardware have been in business in Paisley in tin and hardware since 1875, and carry a stock of about $4,000 in shelf and heavy hardware, stoves, tinware, paints, oils, etc. and do a large trade. Mr. ].W. McDonald has a turn for invention and several very useful and valuable contrivances have been invented by him among which is his patented “Duplex Damper”. The splendid brick Store which they occupy, heated by hot air throughout, is ample evidence of their desire to improve. Mrs. Mclntyre runs the “Golden Lion” grocery which was established in 1875. A good $6,000 stock of groceries, crockery, and glassware is carried, and in addition to this is a stock of boots and shoes of which Mrs. McIntyre always makes a specialty, both in quality and price, and claims to have the best selected stock of these in town. Two years ago she put up a fine brick store which she now occupies and fitted it out with a plate glass front and every facility for the business. The present firm took full management of this business in January 1889, and employ 8 hands in the Flour and Saw mills. They manufacture and keep on hand for wholesale and retail, flour, made from Ontario and Manitoba wheat, also all kinds of mill feed. Gristing, chopping and general farmers trade made a specialty. At the sawmill they manufacture all kinds of lumber, shingles, and lath, dressed and matched ceiling, flooring, rustic and wainscotting which are kept constantly on hand for sale. The Paisley City Mills, on the full Hungarian process, is one of Paisley’s heavy institutions. Mr. Stark ships his flour to all points in Canada and the old country. His sawmill also does a large trade, and in the two he employs a large amount of labour. John Coulter runs the Paisley meat market, and old butcher business which was established in 1874. He purchases good animals and has on hand at all times a full stock of meats. Mr. Jas. Barrie, Shoemaker Mr. Barrie has run a shoe shop in Paisley for 21 years. He employs a journeyman and has an annual output of about 551500. which goes principally among the farmers. Mr. Barrie feels that the Dry Goods stores do the shoemaker an injustice by dealing in boots and shoes. The Central Livery owned by Anstead and Purdy, was established by J. J. Weir three years ago. They keep a good stock of horses and rigs and are prepared to do teaming besides. W.S. Given commenced business in the stand formerly occupied by Mr. R. McFarlane. He has succeeded in building up a new trade, and last year purchased a new and more suitable store, putting in a large stock of staple dry goods, boots and shoes. Mr. Hornell can claim to be the oldest in business in Paisley. He set up the bakery business in 1863 and continued it for over twenty years, when he sold his stock and leased the premises to Mr. Geo. Munn. Last year he again took hold of the business; in addition to his stock of bread, cakes, biscuits, confectionery and groceries, he also keeps crockery and glassware. The Paisley Foundry is an old institution. When reapers were a novelty they manufactured the Paisley Wrought Iron Harvester. In the spring of 1887 Mr. John Stewart became proprieter. In the summer they do a large jobbing trade, and manufacture very good straw cutters, turnip cutters and horse powers large and small. H.B. Putnam of the “Mammoth House", established this business in 1882, purchasing the large brick building known as Bruce’s Store. He has a large stock consisting of dry goods, groceries, ready made clothing, hats and caps. Special attention is given to the lines of dress goods, tailoring and ready made clothing departments. Frank Carter opened his blacksmith and carriage shop in 1876 and his success gives a plain example of the result of diligence and close attention to business. 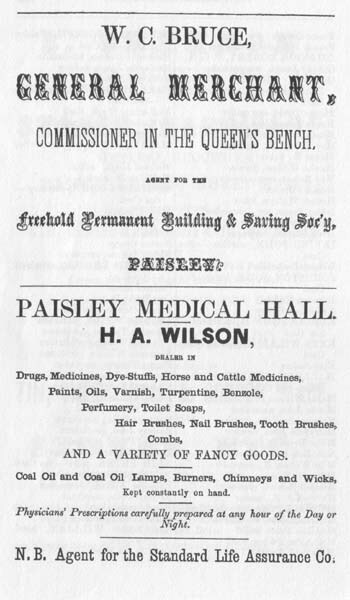 Chemist and Druggist has been in business in Paisley since 1871. He is also Commissioner and conveyancer, notary public for the Western Bank, issuer of marriage licences, agent for several steam ship lines and town agent for the Grand Trunk. J.C. Gibson is one of the pioneers and has been in business some 17 years. He carries a general stock of about $10,000 and does a considerable amount of office work besides, for which he is well adapted, being a rapid penman. He has also as J.P. done most of the magesterial business for several years. C. Colville has been but a little over a year in Paisley, but has established a reputation for good work done, and cheapening of prices. A. Galbraith has been in the grocery business for about two years. Last fall he moved to Mr. Given’s old stand and placed in it a good stock of groceries, making teas, sugars, and tobacco a specialty. The north end store was established in 1882, carries a stock of $10,000, and does a large trade in gents clothing and furnishings, general staples etc. There is also carried a good stock of groceries, boots and shoes. Jas. Bone has been for more than twenty years Paisley’s Tanner, and conducts one of its noted industries in which employs considerable labour and pays out a great amount of cash for hides, and his output is shipped to Toronto.